August 2016 Employee of the Month! We asked Lance to answer a few questions about YES. Here's what he told us. 1. How did you find out about YES? My uncle told me about your staffing agency. 2. Whats been your favorite job through YES? Cement and welding because of the people I work with. 3. What do you think would make YES better? Can't think of anything. 4. What would you tell someone looking into working with YES? It's a great employment company with a great staff! Lance was awarded a thank-you certificate and YES hat for his great work. 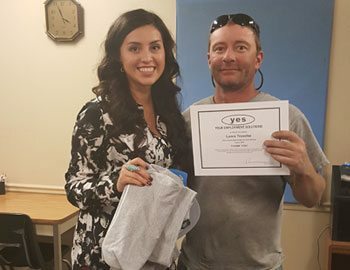 Thanks again Lance for being a part of the hard-working Logan, Utah staffing team at Your Employment Solutions! We asked Hugo to answer a few questions about YES. Here's what he told us. 1. How did you find out about YES? I found your staffing agency on the internet while doing a job search. 2. Whats been your favorite job through YES? Orbit, it's a friendly work environment. 3. What do you think would make YES better? I wouldn't change a thing. YES is easy and convenient. 4. What would you tell someone looking into working with YES? YES is very helpful and will work to find a job near you. Hugo was awarded a thank-you certificate and YES hat for his great work. Thanks again Hugo for being a part of the hard-working Utah staffing team at Your Employment Solutions! We asked Wilfred to answer a few questions about YES. Here's what he told us. 2. Whats been your favorite job through YES? Innophos. It's a good company, friendly people, and I am busy the way I like. 3. What do you think would make YES better? Sometimes, depending on the situations, would be more informative communication. 4. What would you tell someone looking into working with YES? To open up with good attendance, attitude, and don't be afraid. To just remember that what a person makes of his work not only reflects the company but shows off one's pride in what they do! Wilfred was awarded a thank-you certificate and YES hat for his great work. 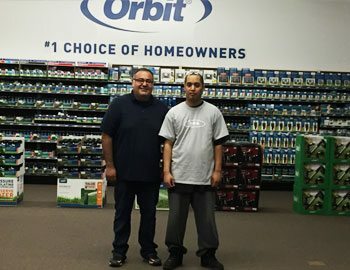 Thanks again Wilfred for being a part of the hard-working Ogden, Utah staffing team at Your Employment Solutions! 1. How did you find out about YES? I walked in. 2. Whats been your favorite job through YES? Easton. 4. What would you tell someone looking into working with YES? Go to YES for good work! Anthony was awarded a thank-you certificate and YES hat for his great work. 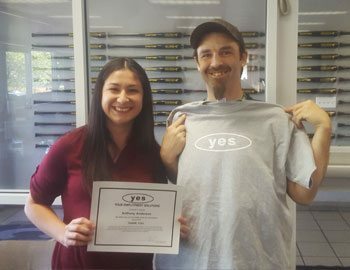 Thanks again Anthony for being a part of the hard-working West Vally City, Utah staffing team at Your Employment Solutions! Maryrose was awarded a thank-you certificate and YES hat for her great work. 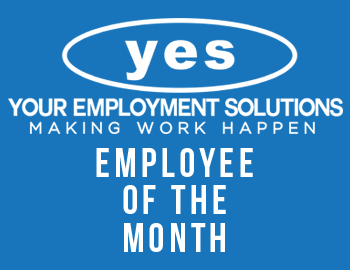 Thanks again Maryrose for being a part of the hard-working Salt Lake City, Utah staffing team at Your Employment Solutions!